The Original Unicorn Name Generator - For Glitter and Rainbows! The Original Unicorn Name Generator - Bring on the Glitter and Rainbows! Do you need more magic and rainbows in your life? Are you a creature of myth and legend who likes hanging out with fair maidens? Would you look simply divine with an impressive horn? 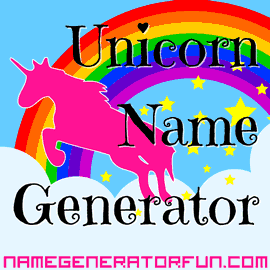 If so, it's time for you to give in to your destiny with The Original Unicorn Name Generator! Break out your glitter and rainbow paint, shine up your silver hooves, and get that mane curled to perfection! Get prancing and show off your party personality! Our very special magical generator is going to reveal your unique inner nature! At heart, everyone is a sparkly unicorn trapped in the body of a human being, and now it's time to let loose and have the world see your true self - hooves, horn, and all! Go on, you know you want to! You can create a random unicorn alter ego, or one that's specific to your first and last name. You can choose your unicorn's gender, and you'll also get a description of your unicorn's personality and what they like to do to have fun! It's ideal for RPG players in need of a magical and outrageous persona, for drag queens who need a fresh identity in a hurry, for distinctive and memorable screen names, or to just add a sparkle of fairy dust to your day! How could anyone argue with that? With your amazing new name you will shine like a disco diva and sparkle like a star! No one will be able to stop you! You'll prance that rainbow like no other! Just remember: everyone is completely unique and special, and at the very same time everyone is a rainbow-coloured unicorn! Our page has been online since Emma wrote it in 2010, and it almost instantly went viral with all the most fabulous people on the internet. And Tumblr. It was the first generator to create names for unicorns, and it's the only one that also includes a description and the personality of your unicorn. Knowing who you really are and flaunting it is the most important thing, after all! We hope you enjoy using our generator – and don't forget that friendship is magic, unicorn lovers! If you liked our unicorn names you might also like our My Little Pony names, or our fairy names. You can also check out the rest of our generators via the menu above. Happy generating!